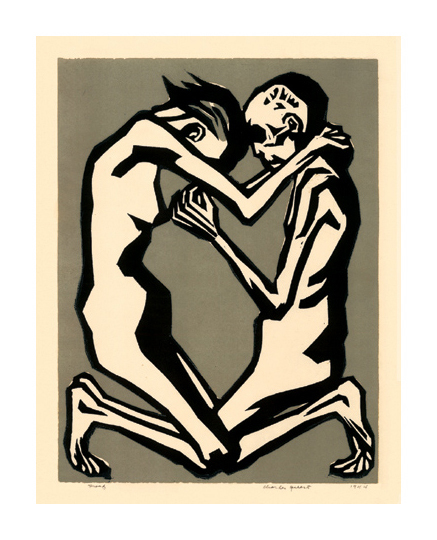 War Victims -- -1944, 2-Color Linocut. Edition 6. Signed, dated and numbered 2/6 in pencil. Titled and annotated Lino cut in the bottom left margin. Image size 12 x 9 inches (305 x 229 mm); sheet size 15 x 10 inches (381 x 254 mm). A fine, evenly printed impression, on cream wove Japan, with full margins (1/2 to 1 3/4 inches), in excellent condition. 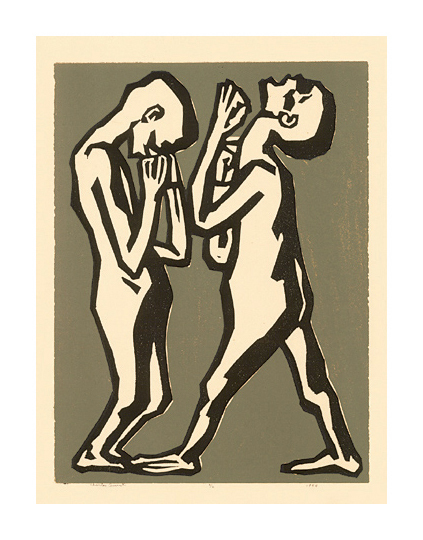 Victims of Internment -- -1944, 2-Color Linocut. Edition c. 6. Signed, dated and annotated Proof in pencil. Titled and annotated no. 2 and Lino cut in the bottom margin. A fine, evenly printed impression, on cream wove Japan, with full margins (1/2 to 1 5/8 inches), in excellent condition. 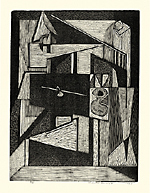 Still Life -- -1947, Wood Engraving. Edition 8. Signed, titled, dated and numbered 13/25 in pencil. Image size 8 x 6 inches (203 x 152 mm); sheet size 11 1/4 x 8 3/4 inches (286 x 222 mm). A fine impression, on off-white wove paper, with full margins (1 to 2 inches), in excellent condition. 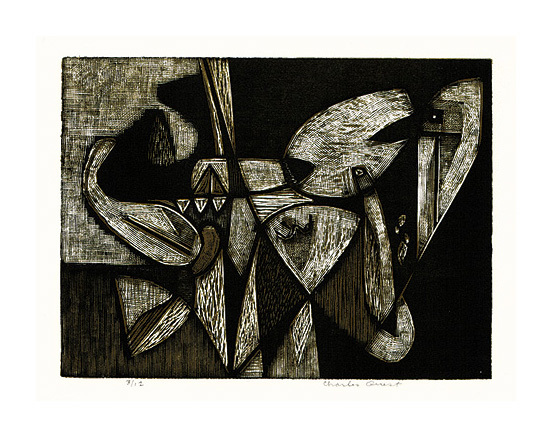 Still Life with Vise-- -1948, Wood Engraving. Edition 25. Signed, dated and numbered 21/25 in pencil. 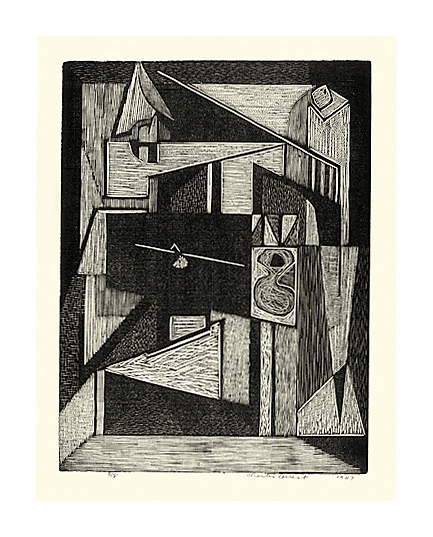 Inscribed by the artist, on the right sheet edge: “Still Life with Vise” Woodengraving -1948 Collections - Museums of Modern Art - Brooklyn Museum Victoria & Albert Museum Museum - British Museum, London, Eng. Image size 4 5/16 x 11 15/16 inches (110 x 303 mm); sheet size 5 5/8 to 15 5/8 inches (143 x 397 mm). A fine impression, on off-white wove paper, with full margins (1/2 to 2 1/4 inches), in excellent condition. Collections: Brooklyn Museum, British Museum, Cleveland Museum of Art, Victoria and Albert Museum. Underwater -- -1948, Color Wood Engraving. Edition 12. Signed, titled, dated and numbered 3/12 in pencil. Image size 4 7/16 x 6 inches (113 x 152 mm). A fine, rich impression, with full margins (5/8 to 1 1/2 inch), on off-white wove paper, in excellent condition.